Put This In The Garage Next To The Lamborghini | OhGizmo! Jetpacks have always seemed extremely cool, even if the prospect of going hundreds of miles an hour with only a set of goggles protecting you from a speck of dust that could gouge your eyes out. Yesterday a real jetpack was revealed to the people at the Experimental Aircraft Association’s AirVenture, a weeklong air show in Oshkosh, Wisconsin. 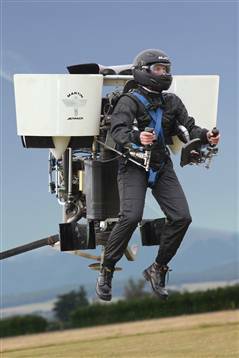 The Martin Jetpack, which is technically classified as an ultralight aircraft, can hover for 30 minutes and can theoretically reach 8,000 feet. So far the jetpack has only gone as high as 6 feet with someone wearing it. No one is allowed to fly this $100,000 machine without having 15 hours of training and a safety screening that presumably keeps the Bond supervillains from getting their hands on one of these. Technically not a jet pack as it is obviously powered by two turboprops. Further, it would seem that it may not be all that stable if it requires 2 helpers. Sorry, mcman, but they’re not turboprops (jet-powered propellors) either. They are simple gas-engine powered ducted fans. 15hours of training may be a way off since the prototype hasn’t gone more than 30seconds so far…. I’m betting we wont be seeing any more of these than the Bell Rocketpacks from the 1960’s (a few stadium and movie appearances). Eveyone’s so hyped about jet packs, there have been a few around for a while now, i don’t remember the name, but i’m sure that they’re on youtube. …That's a fine demonstration of ground effect. This thing has never seen true flight.